So I finally got around to having enough time to set up a Java-based DXA connecting to a Content Service in the Amazon cloud. It was a fun adventure, to say the least, and most of it is due to my rustiness in Java. 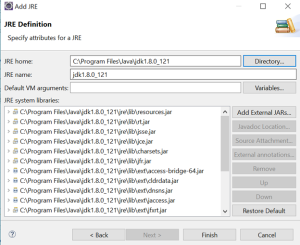 I have tried with both Eclipse and IntelliJ Idea, and definitely IntelliJ made it a lot simpler by detecting project dependencies and installing them for me – which actually made it harder to get Eclipse to work, as I hadn’t noticed what it had done. 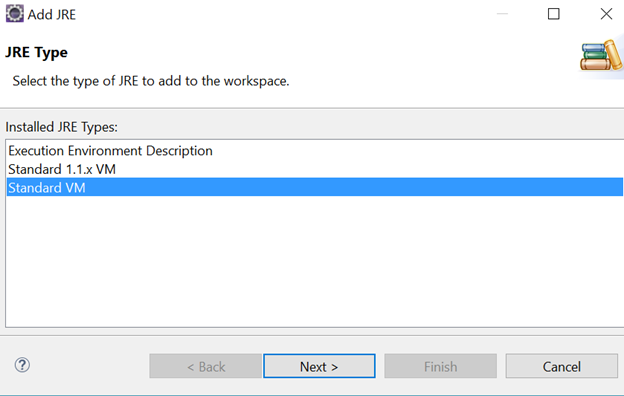 Anyway – below are the steps I followed to get a local instance of DXA running within Eclipse. 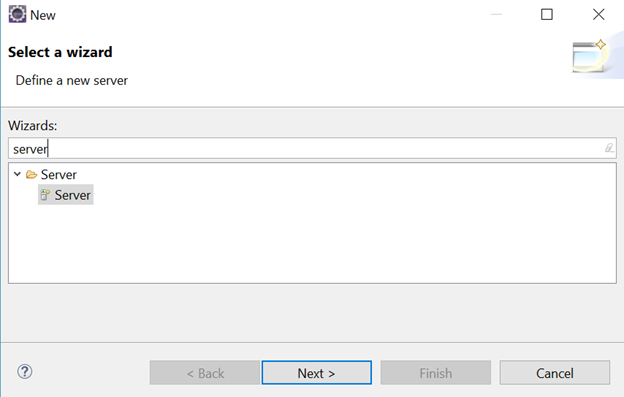 As with the .NET install, you need to make sure you have a proper firewall configuration allowing communication between your machine and the CIS, as well as having the right mappings set in Topology Manager (I used the default of “localhost:8080″ for this). I will not cover those steps in this post. 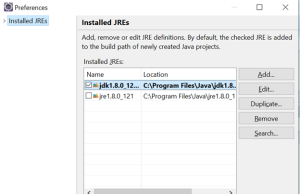 Download a standard JDK from Oracle’s website – I went with whatever was the latest version, 64 bit. Once it’s installed, make sure you set the JAVA_HOME environment variable in your machine, as Maven will need this. 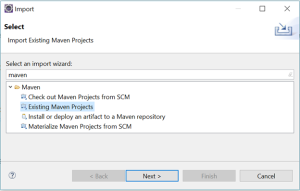 Head over to Maven’s download page and download the latest one for windows, unzip it to a location you will remember and then make sure to add “maven\bin” to your path environment variable. Oddly enough, this was what took me the longest, as for some reason eclipse.org was super slow today. Eventually, this mirror worked the best for me, but YMMV. 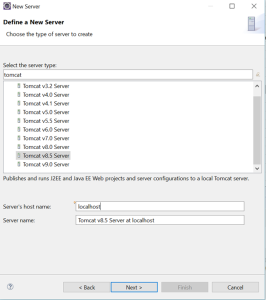 You need an app server to run your application, so we’ll be using Tomcat for this. 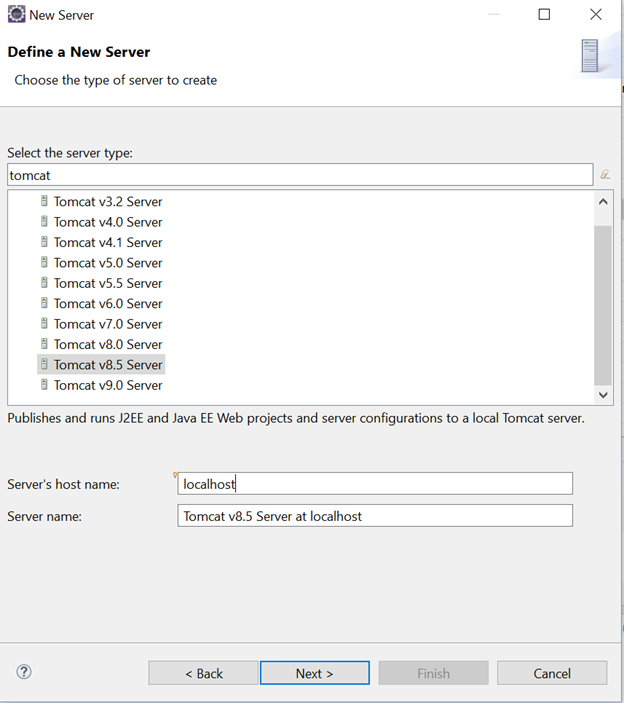 Head over to Tomcat’s download page and get Tomcat 8.5x (I used 8.5.12). Unzip it somewhere you will remember! Don’t ask me what it is, I didn’t bother checking that other than noticing it was needed (thanks to Alexey Zarakovskiy from SDL’s DXA team for pointing me in this direction). 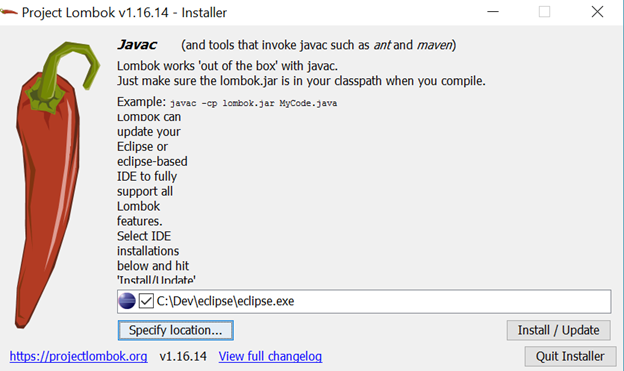 A simple wizard will ask you to identify where your IDE is, enter the path to eclipse, and click “Install/Update”. Now that we’re done with the prerequisites, let’s get our DXA going. 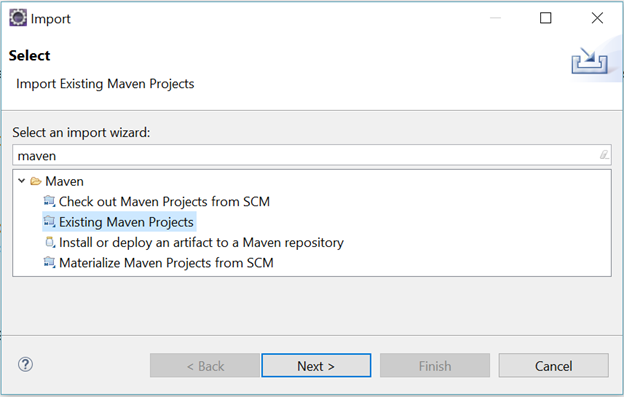 The first thing we need to do is to download it, and we will use maven to do this for us. Below are the steps I followed, if you know what you’re doing, feel free to improvise – if you don’t know what you’re doing, do exactly as I did. Now you should have a set of subfolders created under c:\dev\java-dxa, and one of them (dxawebapp) will have a pom.xml, which we will need soon. Optionally, set this new JRE as the default. Browse to the location where you downladed the POM to (c:\dev\Java-DXA\dxawebapp in my case) and click Finish. Wait a few minutes for the import to finish. 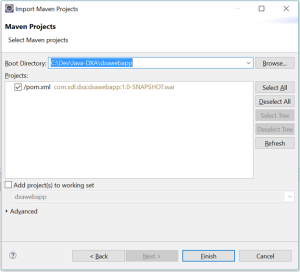 You now should be able to see in your workspace a “DxaWebApp” project. Let’s add the core module to it. 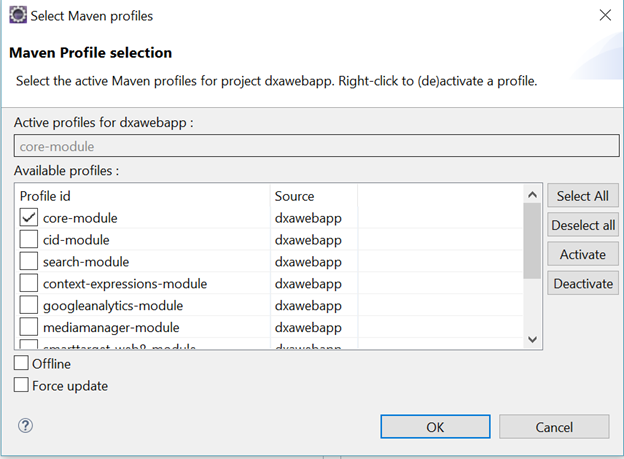 In the window that shows the available profiles, check the box next to “core-module” and click OK.
Last step… you’re almost there! 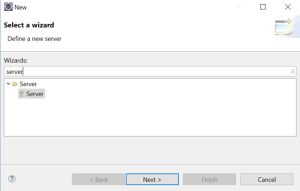 Edit the cd_client_conf.xml file and enter the URL to your discovery service, as well as the cduser and password to use. 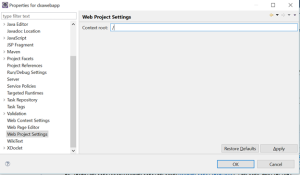 Once that’s done, just right-click the project, select “Run As -> Run On Server”, select the tomcat server that you configured earlier… and wait. This entry was posted in Content Delivery, Digital Experience Accelerator, Tridion news by nuno. Bookmark the permalink. I am hoping to automate as much as possible so I started looking at compacting the Getting the DXA with Maven part, hoping to be able to batch it. 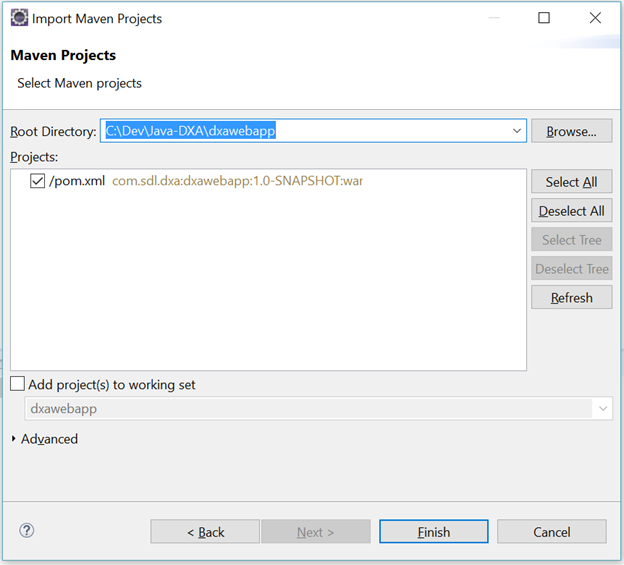 No luck so far but we can compact the output and interactive steps by passing parameters to Maven. Can anyone improve this to pass all parameters so we can run as a batch? very nice stuff as always Nuno! Note that the idea of instantiating a Maven archetype instead of just copying a “jumpstart project” (like we do in DXA.NET) is to create a new project, with your own distinct group ID, artifact ID and package name instead of using SDL-defined ones. So, even though things will work if you use `com.sdl.dxa` as group ID and package name, it is not recommended to do so; invent your own IDs/names. Thanks for posting this, Nuno. It definitely came in handy! I was following a combination of the SDL Web 8.5 single machine installation instructions and the DXA 1.7 installation documentation. At the end of the DXA 1.7 installation steps, you get a web application built in the web\installer\build folder, but there are no further instructions. At that point, your above steps take effect and complete the full process of running the application in Eclipse. – I had to update the port number to 93 in my Tomcat server.xml file, since I was following other instructions that set the mapping up at port 93. You alluded to this. 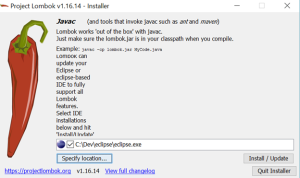 – Some log statements were not compiling out of the box. I still need to figure out why (for now I just commented them out). Excellent step-by-step article Nuno. 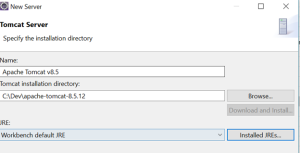 Do you know if the same steps will work with a 2013SP1 setup or is it specific to Web8.5? 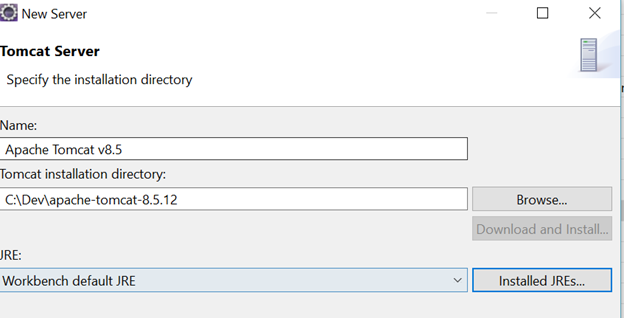 If not, what would be the differences for getting this working against a 2013SP1 setup (I assume it would be related to CIS)?